We’re in the eye of a political storm, sitting in that moment between two political conventions. The Republicans have had their turn to nominate and hail their candidates. Next week the Democrats will gather to renominate the President. One theme you’re undoubtedly to hear in both conventions is the extolling of American Exceptionalism. You have heard and will hear the United States described not only as a unique nation, which it is, but the greatest nation that has ever existed. You’ll hear calls for God to bless the nation in tones that invoke the idea of chosenness. There has long been a theme in this country that we are the new Israel, the Chosen People, whom God loves more than any other. 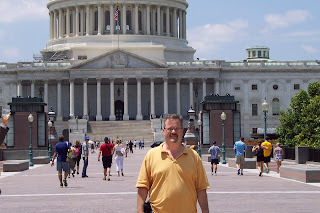 Do we need rules and regulations to govern our lives? Or should we be free to make our own rules? Those are the kinds of questions that are permeating the political realm. As the election cycle nears its climax, we hear some politicians claim that there too many regulations and these regulations hurt businesses and raise the cost of products for consumers. On the other hand, there are those who say that that if we water down regulations then unscrupulous corporations and individuals will harm the citizenry. Do we really want to weaken the clean air act? Dr. Bruce Epperly, a frequent contributor to Ponderings on a Faith Journey, is set to begin another series of of conversations with my readers. Serving this autumn as Visiting Professor of Process Studies at Claremont School of Theology and Claremont Lincoln University, Bruce is going to be offering weekly reports/reflections on this latest holy adventure. In this piece he sets out the parameters of the adventure and invites us to join him for the journey. So, for the next number of Wednesdays, Bruce will be present with us. Join with him on the journey and share your responses! Are you "sitting pretty" right now? Do you live a life without trouble or concern? hat's a question that was raised in a sermon more than sixty years ago by the founding minister of the church I now pastor. Using Luke 12:19 -- "I’ll say to myself, You have stored up plenty of goods, enough for several years. Take it easy! Eat, drink, and enjoy yourself" -- as his text, he suggests that no one ultimately ends up "sitting pretty." No one can just sit back and rest on their laurels. Are real cross-party political conversations possible? Has a preacher ever said something that offended you so much that you never went back to that church? I hope that none of you will take offense at what I say today, or if you do, I hope you’ll come back next week! And what about Jesus, is there anything that he said that offends you? I’d be surprised if you said no. After all, Jesus did have a tendency to say things that got him into trouble. Remember how his sermon back at his hometown synagogue went? He was just coming off being baptized by John and had begun to gain a following. But as they say – you can’t always go home. You may have heard it said by Jesus that it's easier for a camel to go through the eye of a needle, than for a rich person to enter the Kingdom of God (Matthew 19:23-24). Would you call that an example of class warfare? We Americans have for a very long time imagined ourselves being a rather unique and special people. This view served as the basis of the doctrine of Manifest Destiny and American Exceptionalism. 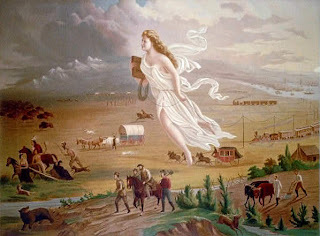 Manifest Destiny drove the nation’s expansion across the continent and beyond, fueling the imperialism that took hold after the “frontier” was conquered and the indigenous peoples displaced. We have envisioned ourselves as a chosen people, a new Israel. But why? And what are the implications? It could be the devil, or it could be the Lord, “but you’re gonna have to serve somebody.” So who is it going to be? Bob Dylan’s question of thirty years back is reflective of the questions asked by Joshua and Jesus. Who are you going to serve? THE COLOR OF CHRIST: The Son of God and the Saga of Race in America.By Edward J. Blum and Paul Harvey. Chapel Hill: The University of North Carolina Press, 2012. 325 pages. A young African American boy – he might have been twelve years old – came to the microphone and asked the panel of religious leaders gathered to address issues provoked by Mel Gibson’s The Passion of the Christ and asked: Why is Jesus always pictured as being white? The venerable and to many saintly Catholic priest took the microphone and intoned – “Why, because he was Jewish.” Is that really the reason? Or is there more to it than this? Could it be that there is a link between our vision of Jesus and a sense of cultural and even racial superiority? I should add that the Imam responded that in the Qur’an Jesus is said to have brown skin – sort of like a Palestinian.